31 January 2019 (Toronto, ON) - Lil Baby has shared the video for his track "Global" off his latest mixtape Street Gossip, out now on Quality Control Music/Motown Records/Capitol Records/Wolfpack Global/Universal Music Canada, the country’s leading music company. The video documents his recent travels to Paris, Manchester, Lagos in Nigeria, Freeport in the Bahamas and more as he continues on his path of global stardom. 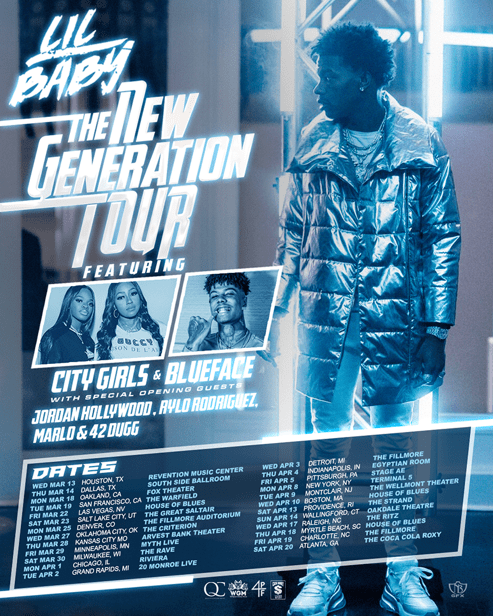 Yesterday Baby announced The New Generation Tour across the US with QC label-mates City Girls, Jordan Hollywood and Marlo, LA rapper Blueface and more. Tickets are on-sale tomorrow HERE, full tour dates below. Lil Baby recently performed “Put a Date On It” with Yo Gotti on The Tonight Show Starring Jimmy Fallon. Watch it HERE.